Star Fleet Battles is an intricate game of ship-to-ship combat in the classic Star Trek universe (the one Kirk explored). Several other races have been added for variety. Tournament battles are like tense chess matches, with each player trying to bring his ship 's strengths to bear. Last year 's tournament was once again the largest in the whole country, and we expect record attendance this year. We 're going to start the con early, 10am on Friday, to get the Star Fleet stuff going. Fight patrol battles all weekend, until we start the finals either Saturday evening or night, depending up on enrollment. If you change your ship mid-tournament, you need to pay a new $5 to re-enter. Semi-finals and Finals will be Sunday. To make it easier for you to try the game if you're interested, look in your registration packet for a coupon to play the first game free. If you'd like to continue in the tournament, you can pay to enter. But if you'd just like to learn a new game, it's on us. Beginners encouraged. Can you and your allies defeat the your opponents before time runs out? Learn to play or sharpen your skills with these 4th edition Dungeons and Dragons encounters. Characters provided. These quick RPGA adventures are an excellent way to pass some time if your other games end early, or if you 've got a break in your schedule. Some scenarios are a quick one hour. There are also two hour scenarios set in the NEW Dark Sun RPGA game universe. Just come to the upstairs RPG area and check in with the RPGA coordinator; we 'll get you into a quick "Delve" game. These games are also FREE to anyone interested. Please see the RPGA scenario descriptions at the end of the event listings for full info. Please also use the Warhorn.net registration to reserve a spot in a specific game, but use the event code above (A-RPGA) to purchase a ticket for any RPGA game in this time slot. Beginners are encouraged and veteran players are always welcome to DM. Beginners encouraged. This is the Avalon Hill game of swords and sorcery, adventure and general mayhem. No previous experience with the game or rules necessary. All game materials will be provided. Beginners encouraged. Japan is in the Sengoku Period and each player assumes the role of a great Daimyo hoping to become Shogun by owning provinces, temples, theaters and castles. Developing their kingdom will be paramount to success, wise use of the troops at their disposal will be a key. This is NOT the Gamemaster series Shogun. It is a retheming of the popular Wallenstein game system. A central focus is the unique Cubetower that is used to resolve battles between armies. The troops that meet for battle are all thrown into the tower together and whichever army has the most troops come out of the bottom of the tower achieves victory. Relive England's 1st Civil War, The War of the Roses. In Kingmaker you head a noble faction building it into a power base that supports an heir as it seeks to eliminate all rivals. Winning at Kingmaker depends both on skill and on seizing opportunity! Fast moving play comes from sudden turns of fortune as a random event is determined at the start of each player 's turn. With a bit of diplomacy and quick shifting strategy can you turn the event into a new opportunity that favors your cause? Only one Lancastrian or Yorkist will rule, will it be you? If you have a copy of this game, please feel free to bring it along. That way, we can accommodate extra players. Beginners encouraged. In China, 2000 years ago, Loyang has risen to become the capital of the Han Dynasty. The economic upturn of the now-flourishing city requires a better supply of basic foodstuffs. Players are local farmers, who grow, trade, buy, and sell a bounty of vegetables - wheat, pumpkins, turnips, cabbages, beans, and leeks. The most skillful farmer will be the player who moves furthest along the Path of Prosperity. This heavyweight economic game was designed by Uwe Rosenberg, of AGRICOLA and LE HAVRE fame. Beginners encouraged. We strap you into an X Wing and let you fly against a horde of TIE fighters to learn Squadron Strike with very simple weapons and very simple ships. This is your chance to learn Squadron Strike from the game 's designer! Beginners strongly encouraged. It 's WWII and both the Japaneese and Americans want to supply a Pacific Island with Troops & Supplies. Come Command Carriers. Cruisers and Destroyers. Fly over the Fleet, shell the enemy 's Airfields & get those Transports ashore! We 're relying on you to help us win the battle! Beginners encouraged. Can you meet the challenges of World War II naval combat and become an Admiral? Patrol your coast to protect merchants from raiding submarines. Infiltrate an enemy destroyer screen to attack vital commerce. Duel with an enemy carrier while protecting your own. Support an invasion force with naval gunfire while defending your command from an opposing fleet. To achieve victory (and the Admiral 's stars) you will need to be successful in all these missions and out perform your fellow officers. This event will use the Axis & Allies: War at Sea rules with extensive house rules. Including: a larger map, hex based movement, firing arcs, hidden movement for submarines, size class based movement, aircraft with limited fuel. This is a 2 session event, with the winning players playing a total of 4 scenarios. In the first session up 8 players will be conducting ASW operations and trying to infiltrate the defending screen in 2 scenarios. In the second session 4 players will duel with carriers, and finally 2 players will support an invasion force. Detailed information on rules, format, and scenario details can be found at the link. Check for updates before the Con. Beginners encouraged. It is 1711. and a French Army has crossed into Spain to help King Felipe Vth drive out the British, Dutch and Austrians and their Pretender to the Spanish throne. In the narrow valley of the Rio Noguera, Noailles unexpectedly meets the Confederate army waiting for him. Plenty of troops, plenty of dice, plenty of bloodshed, not much room to maneuver. Beginners encouraged. Your team has been engaged to search out and eliminate the killer known as Night Scourge. However, along the way complications develop, which means your rates go up. Beginners encouraged. You have been hired by a merchant to figure out what why his caravan of spirits from the south have not been arriving. First he was only getting half shipments then they stopped all together. Levels 1-6. Players bringing new characters should bring 1st level basic characters. Beginners encouraged. A station wagon full of campers is limping into the small town of Farville, in dire need of repair. Unfortunately, the town's mechanic (and everyone else in Farville) is more interested in eating the campers' brains than in fixing their engine. A 'Blood Brothers' adventure in the vein of the Romero 'Living Dead' films. Send... more... investigators! Beginners encouraged. Your invitation for the masked ball celebrating the 40th anniversary of Edgar Allen Poe's death says that the party at "Prospero Hall" starts this evening at sunset. While the locals were friendly enough when you got off the stage, they have been surprisingly tight lipped about "Prince Prospero" and his mansion on the hill. What mysteries will be revealed to the party during the celebration? While I welcome players that bring their own characters, pre-generated characters will be available. Players should bring Dice and a deck of regular playing cards. Copies of Deadlands:Reloaded and Savage Worlds would also be handy, but not necessary for the event. Beginners encouraged. Pathfinder Intro-Master of the Fallen Fortress is a dungeon-based adventure for 1st-level chararacters, written for the Pathfinder Roleplaying Game and compatible with the 3.5 edition of the world's oldest RPG. It also serves as an introduction to Pathfinder Society Organized Play (Paizo's constantly evolving, world-wide megacampaign). The adventure involves exploring an ancient, ruined tower and rescuing the captured Pathfinder held within. This is an introductory adventure, and is especially suggested for those new to the Pathfinder system. Beginners strongly encouraged. Off the coast of La Florida, the waters have always seemed warm and inviting. Recently, however, you have learned not to trust the gentle waves, for comfort often comes immediately before betrayal. Someone thirsts for revenge, so there is little time for rest. Dark Providence 2-04 - Cargo, by Matthew Domville. Once you cross the Volga your chances of getting a rifle improve greatly- and remember to be a good comrade and listen to your Commissar... Some knowledge of this rules system preferred. Please see the RPGA scenario descriptions at the end of the event listings for full info. Please also use the Warhorn.net registration to reserve a spot in a specific game, but use the event code above (B-RPGA) to purchase a ticket for any RPGA game in this time slot. Beginners are encouraged and veteran players are always welcome to DM. Beginners encouraged. Each player is a zoo owner who is trying to build the best zoo by collecting animals to fill his enclosures. Placing a variety of vendors' stalls placed throughout the zoo will also help the zoo. We will use one or two of the expansions, to make our zoos even more attractive for visitors. Beginners encouraged. In Small World, players as vie for conquest and control of a world that is simply too small to accommodate them all. We'll be playing with the Grand Dames and Cursed expansions. Beginners encouraged. Using the main game, and elements from Innsmouth, Kingsport, and Dunwich expansions, explore the haunted towns, horrific coasts, and decaying farmsteads of H.P. Lovecraft's mythos. Sanity will be lost. Beginners encouraged. Stalingrad - The northern factories. A ghastly place for a battle... heavy metal sheets creaking in the wind. Smart animals flee, leaving only rats to thrive in this burning hell! Beginners encouraged. Through the Ages is a civilization building game. The goal is to develop your civilization, not to destroy other ones. Military strength is just one aspect of your nation, as well as population, production or science. It is up to you which aspect you will concentrate on, more or less, but you should not underestimate any of them while building your civilization. Victory is achieved by the player whose nation produces the most culture during the game. However, there are many ways to produce culture: through religion, literature or drama, by building wonders, by utilizing cultural persons, etc. Considerable amount of culture can be gained even via wars or aggression. 18xx meets Scandinavia. Become a Rail Baron on ice. Run a railroad or two and manipulate the stock market to make yourself the wealthiest Rail Baron in Scandinavia. Beginners encouraged. This classic game of the Fantasy Monster Slugathon is a standby from the Avalon Hill of yore. The game is divided into two realms, the masterboard and the battleboards. On the masterboard, legions of mythical creatures roam about trying to recruit bigger and badder monsters and kill opposing legions in the process. When a combat occurs, the space is "blown-up" by moving the action to the corresponding battleboard type. After lots of dice are tossed, the victor is returned to the masterboard with the spoils of war: points. The Titan is the player 's alter-ego, and the Titan 's fate and the player 's fate are one and the same. Veterans and new players welcome. Feel free to bring your favorite collection of 6 sided dice if you want, but not necessary. Beginners encouraged. Through a thousand years of history, can your colour dominate the British landscape? Your peoples land from the sea and seize territories on the Dark Island, but can they hold against new invaders? Will your leaders, from Boudicca to William the Conqueror, spur your armies to victory? Play BRITANNIA and find out. Some knowledge of this rules system preferred. Twilight Imperium Third Edition is an epic empire-building game of interstellar conflict, trade, and struggle for power. Players take the roles of ancient galactic civilizations, each seeking to seize the imperial throne via warfare, diplomacy, and technological progression. With geomorphic board tiles, exquisite plastic miniatures, hundreds of cards, and introducing a rich set of strategic dimensions that allows each player to refocus their game-plan. PLEASE NOTE: This game will probably run longer than the four hour session slot. Beginners encouraged. For the past three years, the Federated Commonwealth has benefited from the tireless research of Dr. Heinrich Gessler, a brilliant engineer responsible for some of the Davion Heavy Guard 's most devastating Mech designs. Gessler 's revolutionary designs and refits have given the Federated Commonwealth a vital edge over their Clan enemies, most notably Clan Wolf. Through their network of spies, Clan Wolf has discovered that Dr. Gessler is currently on the planet of Tymoor, overseeing the final construction of two experimental assault Mechs. If Gessler were to be killed, it would set back the Federated Commonwealth's war effort considerably. Clan Wolf scouts report that the experimental Mechs are not yet ready for field testing, and that the facility's only defenders are elements of the Davion 3rd Cavalry which are being retrofitted and are in various states of repair. Clan Wolf's assault was not subtle, however; alarms were sounded, and several VTOL gunships are en route to evacuate Dr. Gessler before he can be harmed. Will Clan Wolf find Gessler and slay him, or will the Engineer escape to continue his work for the Federated Commonwealth? Join us for a large Battletech game in which Clan Wolf assaults a FedCom Research & Development facility in an attempt to assassinate an engineer vital to the FedCom's war effort. Painted battle Mechs and tanks, spectacular 3D terrain, pencils, dice, clipboards, mission briefings, and Battletech record sheets will all be provided. Game experience will be extremely helpful, but not necessary. This game will utilize miniatures rules published in FASA 's Battletech Master Rules Revised Edition, and a number of customized battle Mechs created using WizKids Heavy Metal Pro software. Beginners encouraged. Wings of War with jets! Come fight F-86's vs Mig 15's! Rules adapted for jet combat. Beginners encouraged. Link: Wings of War - miniatures! Bring Your best 30 point army. You will be split into 2 random teams, but there can only be one winner. How long will the alliances last, well....that's up to you!! No figures provided, you must bring your own. 30 point army, MKII rules. Prize support from Coopers Cave Games. Some knowledge of this rules system preferred. City of Hitt, Iraq. The insurgents are back and dealing death, the US Marines have to sweep the streets clean; its time to take out the TRASH! Beginners encouraged. Poland 1939: Just as Poland is starting to re-organize its forces after two weeks of intense fighting with Germany, the Russians stab the Poles in the back. Fast moving Russian cavalry and armour are racing to cut off and destroy as much of the Polish Army before it can retreat into neutral Romania. The Poles in the Tarnopol area make the Russians pay for their treacherous stab in the back and bloody them well. Some knowledge of this rules system preferred. Exhausted and hungry your captors call for a halt before an advancing storm... A bolt hits a nearby tree... you find yourself separated from your captors deep inside enemy territory. Can you make it home? An adventure for 3-6 players. No experience needed. Characters created during the event. Beginners encouraged. LONDON 1896 - A British artifact, valuable and historic, has been stolen. The great detective, Sherlock Holmes, and his distinguished team, have been given the task of recovering it. Are you up to the challenge of portraying them in a new adventure? Come to Council of Five Nations this Columbus Day Weekend and find out. While Slayers across the world are busy slaying vampires, teenage girls everywhere are wishing they could be dating the bloodsucking fiends! The popular new book and movie series Dusk chronicles the forbidden love between an awkward school-aged girl and her gorgeous, wholesome vampire boyfriend. The stars of the movie have become instant celebrities, but dark rumors have begun circulating in the supernatural underground that the actor Bobby Patterson is actually a vampire! And now the cast of Dusk is coming to St. Louis where a Slayer and her group of veteran demon hunters must face the greatest horror of all: infiltrating a fan convention! Will they brave the screaming teenaged fans, obsessed cosplayers and fanfic writers, or will they allow a vampire to continue corrupting innocent young minds? Beginners encouraged. The wizard Melkon has sent you on a quest for a dubious spell component! The pay is good, and can say no to a wizard anyway! Level 1-9. Players bringing 1st level characters should use Core rules PHB to make their character. Fellowship of the White Star campaign of Earth, March 23, 1907.
being invited and it may only be played with starting characters who have 0 xp. FWS 301. Beginners encouraged. Pathfinder/Cthulu Classic-The strange city of Carrion Hill has long loomed over the surrounding swamps in eastern Ustalav, yet its rulers have shifted many times through the centuries. Often enough that only a few sinister scholars and curious minds know the true nature of the hill 's original inhabitants vile and depraved cultists of the Old Gods. Yet this morning, a dreadful recrudescence rises from the depths of buried nightmare in the vaults below Carrion Hill. A monster stalks the twisted alleys of the city, spreading panic before it and leaving destruction in its wake. Can the Carrion Hill Horror be stopped? Carrion Hill is an adventure for 5th-level characters, written for the Pathfinder Roleplaying Game and compatible with the 3.5 edition of the world 's oldest RPG. The adventure features a mix of urban and dungeon sites, and draws its inspiration from the popular writings of H.P. Lovecraft. Characters PROVIDED. Please see the RPGA scenario descriptions at the end of the event listings for full info. Please also use the Warhorn.net registration to reserve a spot in a specific game, but use the event code above (C-RPGA) to purchase a ticket for any RPGA game in this time slot. Beginners are encouraged and veteran players are always welcome to DM. Beginners encouraged. This "Lord of the Rings" themed game by Reiner Knizia, while basically a roll and move style game, has some basic strategy. Great for beginner gamers! Beginners strongly encouraged. Seekers of Adventure may enlist to join Professor Chris Bernardi (noted scholar and explorer) in an expedition into the unknown! We first seek out the lost Mayan Temple of Chac in AEG's "The Adventurers" Then we tackle the ancient ruins of Cambodia's primevel forest in Asmodee's "Bakong"
Prospective adventurers should beware that they risk like and limb in entering the jungle and temple- which may be defended by native warriors and/ or deadly booby traps. Inquire at 432 State Steet, Schenectady- Please provide armaments possesed and any special skills that may relate to an Expedition of this sort. Beginners encouraged. Settlers of America: Trails to Rails utilizes the familiar Catan hex-tile grid to present a map of the United States. Players collect and trade resources, in order to purchase, migrate and build settlements, forge railroads and acquire locomotives. Railroads are used to distribute goods to the interconnected cities. As westward locations are settled, old sources of resources deplete. The addition of gold adds to the depth of play and increases options for the players. Beginners encouraged. In colonial San Juan luck and skill go hand in hand. Devise your strategy on the fly as you try to build the most successful settlement in this fast paced card game. Easy to learn, tough to master, San Juan can be challenging and fun to experts and newbies alike. Beginners encouraged. The master of Ravenloft is having guests for dinner  and you are invited! Evil lurks in the towers and dungeons of Castle Ravenloft, and only heroes of exceptional bravery can survive the horrors within. Think Descent, but with an automated GM and quicker play time. Oh and very challenging. Pitch your way to victory! This family friendly game is perfect for beginners and experts alike. "Pitch" your car (wooden disc) around the track to the finish line before your opponents but don't pitch too hard or you'll flip your car and miss your chance at victory! Straightaways, curves, crisscrosses and ramps will challenge your pitching skills! This is a somewhat active game requiring movement around the table to get good shots. The game will include original Pitch Car plus several expansions. Beginners encouraged. A classic tile laying game set in the southern French city of Carcassonne. The players develop the area around Carcassonne and deploy their followers on the roads, in the cities, in the cloisters, and in the fields. At the beginning of the 13th century, construction of the greatest and most beautiful cathedral in England begins. Players are builders who try to contribute the most to this cathedral's construction and, in so doing, score the most victory points. Players must strike a balance between earning gold to fund their purchases and earning victory points. Beginners encouraged. In American Rails, assume the role of a wealthy capitalist managing a portfolio of stocks and bonds in six railroad companies. Through ruthless negotiation and rigorous planning, struggle to increase the value of your holdings and reap the profits. The player with the most money at the end of the game will become the nation's first railroad baron and win the game. Beginners encouraged. Have you ever wanted to be a Robot programer? Well here is your chance. Program your robot and send it out to do battle with other robots on the factory floor. Roborally is a fun game of robot racing! Players will program their robots on an ever changing factory floor, where other robots armed with lasers,and other weapons will be out to win the race across the factory! Beginners encouraged. STARCRUISER is an action packed tactical starship combat game with a unique movement system. This (playable) movement system will present some surprising tactical circumstances and will challenge players of all levels. No experience is necessary all rules will be artfully explained. Come Play Agricola!!! Ranked #2 Board Game by Board Game Geek. In Agricola, you're a farmer in a wooden shack with your spouse and little else. On a turn, you get to take only two actions, one for you and one for the spouse, from all the possibilities you'll find on a farm: collecting clay, wood, or stone; building fences; and so on. You might think about having kids in order to get more work accomplished, but first you need to expand your house. And what are you going to feed all the little rugrats? I have pimped out my copy with wooden pieces that are a very cool addition to the game. I also have the expansion Farmers of the Moor that we can use if we play with only experienced players. Beginners encouraged. The Ministry of Dungeons is examining prospective dark lords--can you meet their standards? Beginners encouraged. Trade, raid and settle the world of the Middle Ages. Cross seas to the edges of the world. Fight bravely under the banner of the Raven and proudly take your place in Valhalla! FIRE & AXE gives players a chance to take on the role of the Vikings during multiple voyages between 750 AD and 1020 AD. During the expeditions, players will trade with the locals, raid their treasures, establish settlements, or try to accomplish sagas. The amount of riches and notoriety will determine how great a mark your Jarl will have left on the Middle Ages. Beginners encouraged. Wings of War focuses on the "knights of the air" age - World War I - portraying the abilities of the fighting planes of this period. Aircraft are represented by finely detailed plastic miniatures in 1/144 scale, which are used as playing pieces on any open surface. Players choose and play movement cards from their aircraft's maneuver deck to decide the actions of the aircraft they control. Different planes use different decks of movement cards to represent their maneuver capabilities, and decks of "Fire" cards are used to take their combat effectiveness into account and to keep track of damage. This game will not be simple dogfight where the whole mission is to shoot down the opposing planes. There will be a special scenario provided with objectives for both sides. Beginners encouraged. Think you have what it takes to win a battle in the Battletech universe? What if an entire Great House was at your command? Test your mettle and your political acumen against your fellow house leaders to become the next First Lord of the Star League. Alliances will be formed, agreements will be broken, and the galaxy will never be the same. Beginners encouraged. A US cavalry patrol is ambushed by Apaches, trapped in an abandoned stagecoach station. Can the cavalry survive? Beginners encouraged. Zombies?? what do you mean? zombies? we are on a space ship for crying out Aaaa! run for the life boats run for the life boats. Can you get your party to the life boats before you are trapped and over run by the zombies? on this big 3d space ship gaming table using THW All Things Zombie rules with added rules for a spaceship. Beginners encouraged. A group of cowboys returning from a cattle drive get caught in a flash flood,they awake to find themselves in a canyon near town. On their way back to town they discover that the dead have risen and now they must fight zombie people, zombie wolves, and each other as they scramble through the canyon searching for equipment and gold. Beginners encouraged. After defeating the Austrians at the battle of Prague Frederick II of Prussia besieged the city. The Hapsburgs assembled another army under field Marshall Daun to relieve the city. Frederick's plan to outflank the approaching Austrians will be tested at Krzeczor, Przerovsky Hill and the Oak Wood. Beginners encouraged. Drafted just before D-Day, and following a rough North Atlantic boat ride spent mostly leaning over the rail of the weather deck, Cheng found himself outside of Avranches on D-Day + 20 well south of the Normandy invasion beaches. His Easy Company squad was trudging through heavy bocage country on recon duty looking for signs for of German stragglers rumored to be conducting a fighting a retreat from Patton 's 3rd Army. Not one to hesitate when faced with opportunity, David figured to see how close they were to what sounded like a vineyard that produced a 1938 Armagnac - red wine. He had just read about the Armagnacs in his last issue of The Wine Taster, which arrived in the first mail to reach him since he landed in France. Before anyone knew it, Cheng, and the squad 's radio had disappeared - presumably down a path where a sign pointed to "Chateaux Beau Vin". After a rather unenthusiastic and hurried reconnoiter left, right, backwards and forward, the squad had no choice but look for him. Was not a matter of "no man left behind" ; Cheng had the radio!!! Come join a dangerously over-armed and under-trained motley squad of misfits reluctantly trudging the countryside hoping to find David and a way home to hot chow! Beginners encouraged. It's the end of the summer year and you and your friends at Camp Mahicanituck are enjoying one last roasted marshmallow and cheesy camp song before school begins. That is when it happens, that is when Ralph, your Camp Counselor tries to eat you. Now it is just you and your friends, banded together against the forces of the living dead... trying to get home. No fires burn throughout the Old Margreve and fey trickery is afoot! Will you journey deep into the Heart of the woods to lift the terrible curse before the cold bite of winter kills countless innocents? Grandmother 's Fire is a wilderness fantasy adventure suitable for four PCs of 8th to 9th level. Pregenerated characters will be provided. Please bring dice, pencils & paper. Beginners encouraged. For the past two hundred years the realm of Rool has experienced an unprecedented time of peace and prosperity. But the recent events of wide spread sicknesses and failing crops may be bringing this to an end, as lepers afflicted with what is being called as "The Flaying" dot the streets and pack churches for the hope of healing, whispers abound in taverns and the streets that the Cener may be returning, or are other forces at work here. Characters will be provided but if you wish to bring your own please bring characters of at levels 6-8 using races and classes from Players Handbook One for D&D 3.5. Baron Tammany Hall has hired your group to handle the Hobgoblin infestation. He wanted an elite team... But he got you. Characters will be developed at the table. This takes about 5 minutes. Beginners encouraged. victory complete: find and destroy the Lich 's Phylactery. Levels 1-9. Players bringing 1st level characters should use Core rules PHB to make their cahracter. In honor of the fallen king and in celebration of the crowning of his heir a great carnival is being held, complete with games and contests of every kind. The winners of each competition will take dinner in the royal palace with his majesty; the perfect opportunity to steal the map to an ancient treasure held in the palace vaults. Play to win as a group of thieves looking to find the key to an untold fortune! Some knowledge of this rules system preferred. This product is a Pathfinder Society Scenario designed for 1st to 5th level characters (Tiers: 1-2 and 4-5). This scenario is designed for play in Pathfinder Society Organized Play, but can easily be adapted for use with any world. This scenario is compliant with the Open Game License (OGL) and is suitable for use with the Pathfinder Roleplaying Game. Pathfinder Society Scenario #45, written by Crystal Frasier. Two years ago, an accord was reached between the Curwen family of House Draconis and the Dardanus family of House Thalus. To put the bad blood behind everyone, and mend some of the deep rifts in Arkham. Cirilius is bethrothed to Erika, but he has been seen keeping the company of another woman. Will the ties bind? Dark Aeons is a game system by Stardust Productions. Think "World of Darkness (White Wolf) meets Call of Cthulhu" . Pre-gen characters will be provided. Please see the RPGA scenario descriptions at the end of the event listings for full info. Please also use the Warhorn.net registration to reserve a spot in a specific game, but use the event code above (D-RPGA) to purchase a ticket for any RPGA game in this time slot. Beginners are encouraged and veteran players are always welcome to DM. Beginners encouraged. Come learn your States and Capitals, all the while learning a new board game! Beginners and children 8 and above are encouraged to play in this "Kids Preferred"
DungeonQuest is a re-imagining of the classic board game of dungeon exploration for 1-4 players. Set in the vibrant fantasy realm of Terrinoth (first popularized by Runebound), DungeonQuest retains the peril, tension, and brutality of the beloved original game while updating both mechanical and thematic elements. Players take on the roles of courageous (or foolish) heroes willing to brave the legendary dangers of Dragonfire Dungeon. Fortune awaits those able to venture into the dragon 's lair. Beginners encouraged. A dark cloud has fallen over Camelot. Sir Arthur looks around those seated at the Round Table- filled with knights who are brave and valiant- and wonders if these men alone will be enough to save his land. Several wars are ongoing with the Picts and the Saxons and his castle is under constant attack from seige weapons. Heroic Quests must be undertaken to retrieve Sir Lancelot's armor, the sword Excaliber, and the Holy Grail... as well as fight a mighty dragon. We must all work together if Camelot is to be saved. But there are rumors that one of us is a traitor. If this sounds like fun, then join us as we battle to extinguish evil and bring good to the Kingdom. Beginners encouraged. This 2004 game has become something of a classic - it's the #3 overall ranked game on Board Game Geek! It combines market, auction, and map control/placement elements with deft balance. Beginners will be taught, play time ranges between 60-120 minutes. Send out your expendition to uncover buried treasure. But be careful not to spread yourself too thin or some other expedition may benefit from all your hard work. In Chicago Express (aka Wabash Cannonball) assume the role of a wealthy capitalist managing a portfolio of stocks of four historical East Coast railroads as they grow across the eastern US to Chicago. Watch out as smaller, more aggressive railroads like the Wabash spring up. Be the sharpest railroad executive and win the game. "When you play a game of thrones, you win or you die. There is no middle ground. King Robert Baratheon is dead, and the lands of Westeros brace for war. House Lannister, whose daughter Cersei was Robert's queen, claims the throne for her young son Joffrey. Stannis Baratheon, knowing that Robert was not the true father of Joffrey, rightfully claims the throne for himself. On the Iron Isles, House Greyjoy is about to embark on its second rebellion, but this time with a much grander goal. In the north, House Stark gathers its strength to defend what is right, and in the south the wealthy House Tyrell harbors an old ambition to sit on the Iron Throne. As armies gather and ravens fly, a clash of kings is inevitable. This event may include materials from expansions based on the number and experience of players. Beginners encouraged. The year is 1937. Air pirates raid the giant zeppelins that serve as the sole lifelines between the independent countries of the now-fractured North America. Air militias have formed in every nation to fight the pirates - and each other. Crimson skies is a fast-paced dogfighting game set in an alternate history where air transport dominates the world... And larger-than-life pilots dominate the skies. Beginners encouraged. The players embody master builders. By building the King 's castle and developing the city around it, they earn prestige points and gain the King 's favor. When the castle is finished, the player who has earned the most prestige wins the game. Beginners encouraged. Tis the dawn of the 19th century; an age of science, superstition, and witchcraft. Howling fills the night as a full moon rises over the small, secluded village of Shadowbrook. Gruesome murders have become a daily occurrence and terror haunts the streets at night. An evil creature has taken up residence here and the countryside is engulfed by a tide of darkness. But all is not lost  not yet. A small group of heroic individuals, with the courage and strength to fight, have arrived in town. Some just passing through while others have come with a purpose; all will be put to the test as they race to save this cursed town from falling into darkness. It will take a cunning mind and strength of spirit to determine who is friend and who is foe  to solve the mysteries and hunt the beast to its lair. But the secrets of Shadowbrook run deep. Gossip and rumors run rampant and these few Heroes may soon discover that they are outsiders here and this town is already so rotten from within there is little left to save. Beginners encouraged. Axis & Allies depicts WWII on a grand scale, full global level. Up to five players can play on two different teams. The Axis which has Germany and Japan, and the Allies which has the USA, the United Kingdom, and the USSR. A full map of the world is provided, broken up in various chunks similar to Risk. The game comes with gobs of plastic miniatures that represent various military units during WWII. Players have at their disposal infantry, armor, fighters, bombers, battleships, aircraft carriers, submarines, troop transports, anti-air guns, and factories. All of the units perform differently and many have special functions. Players have to work together with their teammates in order to coordinate offenses and decide how best to utilize their production points. Players also have the option of risking production resources on the possibility of developing a super technology that might turn the tide of war. Beginners encouraged. Rangers and Indians clash on the border between New York and Canada. 25mm skirmish game using the Trench Wars rules system modified for FIW. Game sponsored by the Connecticut Game Club and the New York Wargamers Association. CGC and NYWA members, family and friends always welcome. Novices, children with adults, rules lawyers and GMs looking for revenge welcome. Beginners encouraged. Players will fight several WW1 biplane combats for the prize - a reproduction Pour Le Merite (the Blue Max). Some knowledge of this rules system preferred. Introduction to the WW II miniatures game; The British anvil & American hammer are trying to slam the door shut on Wehrmacht units fleeing Normandy. All materials provided. Sponsored by GRIMFOE GAMES. Beginners strongly encouraged. In an attempt to further break the Word of Blake stranglehold upon Earth, a light Coalition Battlemech force makes a stealthy entrance into the tunnels below a Castle Brian, rumored to house a vital aspect of the Blakist Space Defense Network. Quickly, however, the Coalition force realizes that the ever-shifting tunnels and Blakist fanatics are the least of their worries, as they are not alone in the caves... and they are not the only ones who wish to know the secrets of the SDS network. Join one of the multiple factions vying for control of this vital location, and make a lasting impression upon the liberation of humanity's birthworld! Beginners encouraged. Vlad the Impaler leads an alliance of Eastern European kingdoms against the Turkish invaders led by their Sultan. Beginners encouraged. The 3rd Battalion 5th Marines are slugging it out with the yellow peril on Aogiri Ridge on the island of Cape Gloucester. It's do or die and blood always makes the grass grow. Beginners encouraged. Elder Dragon Highlander is a Magic The Gathering variant that promotes casual, social gaming with a high replay value. Each player chooses a legendary creature to use as a General. That creature's colors denote the only colors that can be used in the deck. The deck consists of 99 cards plus the General for an even 100. With the exception of basic lands, no two cards in the deck can have the same English name. Generals must also be unique within the game so no two players may have the same one. This means that it would be a good idea to bring a backup general in case someone has the same one as you. You can read the rest of the rules and look over the banned cards list on the website that follows this description. Finally there will be a prize pool for this event. Everyone will get something at the end of the event but the person that wins will get the first pick from the pool. The prizes will be an assortment of 6 x 9 oversized Magic cards from the original Arena Leagu e as well as other MTG related items. 99 Card deck plus your general of choice. I will have 4 extra decks with me for anyone who would like to play but does not have the time/money to build a deck. Some knowledge of this rules system preferred. Dark Sun: To Bring Down A King * Dungeons & Dragons 4th ed. The days leading up to the fall of Sorcerer-King Kalek are rife with plots and counter plots. A group of adventurers are needed to help make sure the Veiled Alliance's plan goes off without a hitch or else Kalek and his templars will crush the resistance once and for all. An adventure for 1st level Dungeons and Dragons characters using 4th Edition rules and set in the days prior to King Kalek's demise. Players should bring 1st level characters, figures, dice, pencils etc. Some knowledge of this rules system preferred. Incident On a Dark Country Road * Call of Cthulhu, 6th Ed. A team of US Marshals are escorting a Asst. US Attorney and a recently brought-in deep cover DEA agent to a court date in NYC. The route is secret and all on back roads. A lot can happen on the back roads. Not all of it good. Not all of it...natural. The rules: Call of Cthulhu. The setting: ? Classic CoC? Delta Green? Blood Brothers? The only way to find out is come along for the ride. Please bring dice, pencils & paper. Beginners encouraged. This product is a Pathfinder Society Scenario designed for 1st to 5th level characters (Tiers: 1 2 and 4 5). This scenario is designed for play in Pathfinder Society Organized Play, but can easily be adapted for use with any world. This scenario is compliant with the Open Game License (OGL) and is suitable for use with the Pathfinder Roleplaying Game. Pathfinder Society Scenario #47, written by Tim Hitchcock and Mark Moreland. This product is a Pathfinder Society Scenario designed for 1st to 7th level characters (Tiers: 1 2, 3 4, and 6 7). This scenario is designed for play in Pathfinder Society Organized Play, but can easily be adapted for use with any world. This scenario is compliant with the Open Game License (OGL) and is suitable for use with the Pathfinder Roleplaying Game. Pathfinder Society Scenario #55, written by Thurston Hillman. Beginners encouraged. "Heir to a fortune, trapped six feet under a wine cellar." That's what the posting at the local inn says. Apparently the rest of the Graton family wants some help getting the old coot out. Goodness only knows why they don't just get a shovel. Still, the reward sounds worthwhile; 10,000 gold and case of the family's best wine. How hard could it be? Please bring characters of 6th to 8th level, dice and any needed books. DM will only have limited pre-gens available. Some knowledge of this rules system preferred. Now that you all have rifles and vodka you can summon your courage and fight the Germans- because they would never dabble in the occult and conduct horrible experiments on their fellow man just to gain a military advantage... Some knowledge of this rules system preferred. Please see the RPGA scenario descriptions at the end of the event listings for full info. Please also use the Warhorn.net registration to reserve a spot in a specific game, but use the event code above (E-RPGA) to purchase a ticket for any RPGA game in this time slot. Beginners are encouraged and veteran players are always welcome to DM. Beginners encouraged. Beginners and children 8 and above are encouraged to play in this Kids Preferred event! From Board Game Geek: "The rules are simple enough to write on a train ticket  each turn you either draw more cards, claim a route, or get additional Destination Tickets," says Ticket to Ride author, Alan R. Moon. "The tension comes from being forced to balance greed  adding more cards to your hand, and fear losing a critical route to a competitor." What do you get when the greatest heroes of history, fantasy and sci-fi converge on a battlefield that you design? Heroscape! 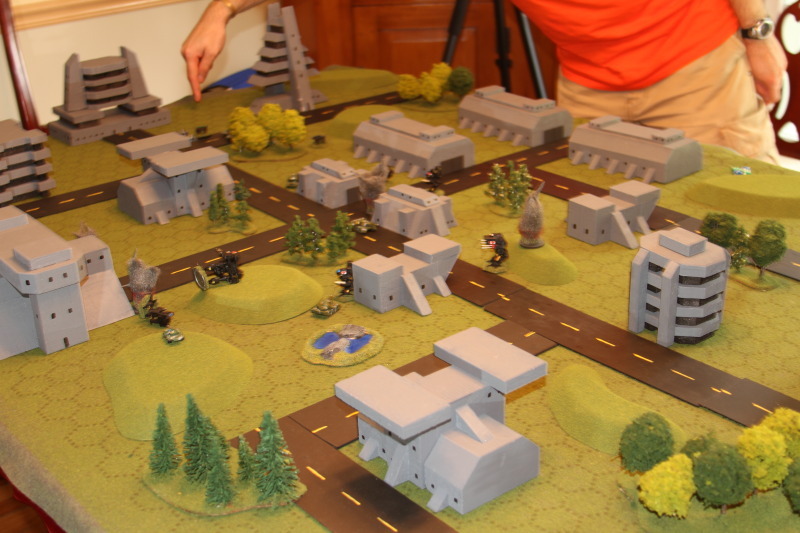 Heroscape is an expandable turn-based miniature wargaming system played using pre-painted miniature figures on a board made from interlocking hexagonal tiles. Control the movements of warriors, monsters, dragons and robots in this epic game of military strategy. Gameplay is intense, easy to learn, and addictive! Beginners encouraged. Cadwallon: City of Thieves is a fast-paced board game of cunning thievery and ruthless skulduggery in a fantasy city steeped in magic and intrigue. Two to four players each control their own gang of four thieves, competing to amass the greatest haul of loot from the many carefully locked chests scattered about the board. This is no friendly competition, however, and there is little loyalty among thieves in Cadwallon! The most successful players are as likely to claim their loot from the other gangs as they are to do the time-consuming legwork themselves... At 45 minutes per game we'll go through 3 scenarios during the time slot. Beginners encouraged. The game system lets players choose the order of the phases in each turn by allowing each player to choose a role from those remaining when it is their turn. No role can be selected twice in the same round. The player who selects the best roles to advance their position during the game will win. Beginners encouraged. A very popular Formula One racing game. We 've got a full set of the different tracks from around the world, so we 'll use the ones we like best. We 'll have time for 3 different races. Special prizes supplied by the SWA. A group of investigators co-operate to save the world by stopping the awakening of an Ancient Evil. Beginners encouraged. Play either as the Axis (Germans & Italians) or the British in the WW-II struggle to control the Mediterranean and North Africa. Can you as the Axis get enough supplies through to Rommel so that he can continue his push to Alexandria? Or, as the British, can you keep Malta fully operational and use your fleets to intercept the Axis supplies and thwart Rommel? Beginners encouraged. This classic game of the Fantasy Monster Slugathon is a standby from the Avalon Hill of yore. The game is divided into two realms, the masterboard and the battleboards. On the masterboard, legions of mythical creatures roam about trying to recruit bigger and badder monsters and kill opposing legions in the process. When a combat occurs, the space is blown-up by moving the action to the corresponding battleboard type. After lots of dice are tossed, the victor is returned to the masterboard with the spoils of war: points. The Titan is the player 's alter-ego, and the Titan 's fate and the player 's fate are one and the same. Veterans and new players welcome. Feel free to bring your favorite collection of 6 sided dice if you want, but not necessary. Beginners encouraged. From ancient Sumeria to the "sun never sets" Btitish Empire, civilizations rise and fall. Can your kingdoms and empires outlast and outshine all others? Try your skill (and luck) in this easy-to-learn but ever-different Avalon Hill classic. (We will be playing the original 1993 AH version.) Beginners encouraged. The world in 2030. The new great powers: China, India, and Brazil are in ascendancy, threatening the hegemony of the old Imperial powers the United States, Russia, and Europe. This has sparked a new global race for power and influence. Ultimately, these six states are only puppets in a treacherous game, because their fates are controlled by powerful international investors operating in the background. Each player takes on the role of such an investor who is on the constant lookout for the maximum return on his or her investment, and therefore tries to obtain ruthless control of great powers. But control of a state may also slip away -- so the cunning investor must always be ready to take advantage of the new conflicts and strategic possibilities of the ever-changing landscape. Imperial 2030 combines economic calculus and military skills in a unique strategy game without any luck of cards or dice. Beginners encouraged. You need no casus belli in this game to take on rival 18th-Century Colonial Powers in your bid to dominate the world! Armies, fleets, diplomacy, the war office, pressgangs - ah, pressgangs - and all that sort of thing can be used as a means to your end (or the end of you). But don't let your country's unrest grow too much: if your people revolt, you lose. Beginners encouraged. The year is 1787 and you are a member of the Constitutional Convention. What amendments would you want in the Constitution? Players lead a group of delegates thru the Constitutional Convention. Each round a new issue is brought up for consideration for inclusion in the document. You must choose whether your block of delegates will support the issue or send it into the committee room for further discussion behind closed doors. Will you be the delegate with the most renown when the Constitution is finally approved? Beginners encouraged. Take a bowl of resource management, add a spoonful of combat, a splash of economics, and a scoop of assymetry and what do you have? The recipe for revolution...or at least designer Francis Tresham's version of it. Revolution is a pure strategy game reflecting the independence movement in the Spanish Netherlands known as the "Eighty Years' War". Each player represents one of the five main factions involved in this power struggle - each with their own motives and objectives. Some factions may help your cause in order to help theirs, but they are not your allies per se. Sorting out when you should count on them and when you should not is part of the fun! Beginners encouraged. What if D-Day did not go as planned? What if weather or more German resistance stalled the Allied troops on the beaches? Hands up was a secondary plan to build Mulberry harbours in Quiberon Bay. First the guns on Belle Ile had to be silenced. This scenario encompasses taking out those guns in a combined Airborne and Amphibious assault. This is a Rapid Fire scenario designed by David Bickley modified to my taste. Beginners encouraged. While a vital strike upon a Blakist stronghold, at the time, no one could possibly anticipate how much would ride upon a single battle. Before the Coalition ground forces could regroup after a cowardly nuclear strike, a surprise strike comes from the far flank... it is the forces of Cameron St. Jamais himself, his bodyguard units moving quickly to take advantage of the momentary confusion. The Battle for Terra will be settled on the plains that surround Devil's Tower. Will Devlin Stone capture this vital Word instillation, or will the sneak attack by Cameron St. Jamais crush the Coalition's greatest hope for victory? The answer will be found on the battlefield. Beginners encouraged. September 11, 1777. British General Von Knyphausens pushes across the ford. Will the Americans hold this time? Slight modifications from the historical battle. This part of the battle is rarely played. If you like this game, please consider coming back tomorrow morning to play another sector of this battle. PLEASE NOTE: This game will probably go past the normal 11pm end time. The British are camped on the banks of the Tulega River when word comes that a Zulu impi is close by. It is imperative that the local farmers be brought to the safety of camp. But it is Sunday, and the farmers may have already left for church. Can the British round up the farmers and their families and get them to the British camp before the Zulus arrive? Beginners encouraged. In the days before the final struggle for the emancipation of the free people of Middle Earth, another tale was unfolding. After the mighty northern realm of Arnor fell under the relentless grinding feet of the legions of the Witch King, hope still lived. This spark of resistance existed in the form of Arathorn, Chieftan of the Dunedain, sire of the greatest warrior the men of Middle Earth would ever come to know. (That's Aragorn, of the Fellowship of the Ring, he's talking about). Doubtless a man of lesser mettle would shrink before the task at hand, for in the wind-swept and mystery-haunted lands of Angmar, an ancient evil lurks. Can Arathorn and his grim-faced veterans penetrate the crypts and catacombs of some long-forgotten king and purge the infested chambers of its dark minions? Although the blood of Isildur runs hot through the veins of the Dunedain, the icy claw of the Witch King of Angmar is enough to freeze the heart of any mortal. Beginners encouraged. A detachment of Prussians with dwindling supplies is under siege. Frederick gathers up a force to break through the evil Russian and Austrians and free his trapped soldiers before they are forced to surrender. Prize support provided by Siege Works Studios, makers of Koenig Krieg. Beginners encouraged. ...Tactics  Flat & Furious! Generations after the exodus of Starfal, endless war pits the denizens of the Land in conflict over their destiny. Does their future lie with the diminished gods called the OtherOnes, or with the alien usurpers known as the Anemetai? The TactDecks Battle System is a card-based strategic combat game set in a precarious world of feudal warfare, magic, and decaying technology. Part card game, part miniature war-game, TactDecks combines the tactical challenges of skirmish wargaming with the collectability and deck-building components of card games. TactDecks emphasizes character-driven play, where each member of your squad possesses unique combat skills or powers. Cast powerful spells. Clash steel. Let arrows fly or twist the battlefield to your advantage with traps or ancient technologies. Everything from characters, to terrain, to system mechanics are all represented on cards. No dice, mats, or books are required, maximizing quick gaming and portability. TactDecks is pocket-sized for fast gaming anywhere there's a table! Swing by the TactDecks demo table, and immerse yourself in a world of legendary battle  or sign up for the tournament! The tournament champions will claim a free TactDecks Basic Set for their own. Beginners strongly encouraged. Now that you 've had all weekend to play demos at the official Your Move Games dealer table, you 're ready for some competitive action. Bring a single 1500 point army for "round robin" play. You can also use one of the standard starter armies in any army faction pack. No terrain will be used. For more tournament details, please go to the Battleground discussion forums (link below), and look for the Council of Five Nations discussion under Conventions . Prizes awarded by Your Move Games. Prizes ~might~ include the brand new Dark Elves cards, hot off the presses. Beginners encouraged. Dragons at Dawn is a retro tribute to the earliest days of Role Play Gaming where the rules are loose and the ideas fresh. We will be taking on a classic adventure for gold and glory. New players welcome, characters will be rolled at the table. Please bring dice and a pencil. This is your chance to play with the game 's Designer! Beginners encouraged. It has been a troubling time for the Midwest, with a rampant blight that claimed much of last year 's harvest and a current drought which grows more severe every day. Now, word comes of a strange illness sweeping thru one small Iowa town. Could this be the final nail in the coffin of America's Bread Basket? The Fellowship wants you to discover what's stalking field and farmer alike and avert a worldwide famine at the same time. This is an FWS event for low level heroes set on May 23, 1907. Part 1 of the Where it Hurts Trilogy, Written by Jonah Bowen. Beginners encouraged. Please see the RPGA scenario descriptions at the end of the event listings for full info. Please also use the Warhorn.net registration to reserve a spot in a specific game, but use the event code above (F-RPGA) to purchase a ticket for any RPGA game in this time slot. Beginners are encouraged and veteran players are always welcome to DM. Beginners encouraged. Dungeons, monsters, secret passages, traps, gold, assorted treasure, magic potions, orcs, goblins, zombies, mummies, gargoyles, an evil sorceror bent on ruling the world..the only thing missing are the heroes willing to stop him....like you. Imagination, sense of humor, sense of adventure Beginners encouraged. From Board Game Geek: "The rules are simple enough to write on a train ticket  each turn you either draw more cards, claim a route, or get additional Destination Tickets," says Ticket to Ride author, Alan R. Moon. "The tension comes from being forced to balance greed  adding more cards to your hand, and fear losing a critical route to a competitor." Beginners strongly encouraged. A semi-sequel to Civilization. Players attempt to build up their cultures during the middle ages through economics and conflict. You build your cash through commerce, adding advances while trying to increasing the misery of your people. A long-time Council favorite! PLEASE NOTE, this event will run into the Sunday 3pm time slot. We will break during 2 hour auction break for lunch and to allow people to participate in the auction. Come try out this game of exploration,discovery and colonization. Players will take on the role of one of the European nations trying to conquer and tame the new world. Beginners encouraged. Fortress America is part of Milton Bradley's Gamemaster series. Fortress America depicts an alternate near-future in which all of the world attacks and invades the continental United States. From the west arrives hordes of Asian foes; from the south arrives a union of South American countries through Mexico, and from the east lands come legions of Soviets who have taken over all of Europe. America besieged has to rely on the remaining ground and air forces left in the country along with partisan uprisings to defend mom's apple pie. Up to four players can play Fortress America, one player is the US and up to three others control the invading units from a particular direction. Being a near future scenario, the units in the game include conventional infantry, APCs, hovertanks, helicopters, bombers, US partisan units, and special "Star Wars" laser relays systems that fire from space. Power Grid fans, come and try out its spiritual successor: Factory Manager, the new stand-alone game in the world of Power Grid. Each player owns a factory and tries to earn the most money during the game, by using his workers to buy the best machines and robots at the market, and then running those machines most effectively in his factory. This game features a clever market mechanism for choosing the supply of factory tiles in the market. Beginners encouraged. Very loosely based on the computer game of the same name, it's a simple and fun transport game set in the early eastern US. Beginners encouraged. Fantasy Monster Slugathon. Custom built game. All monsters and legion markers are on poker chips and the game played on custom enlarged boards. Game has two levels of play. Players move legions on one large map recruiting minions to fight with. 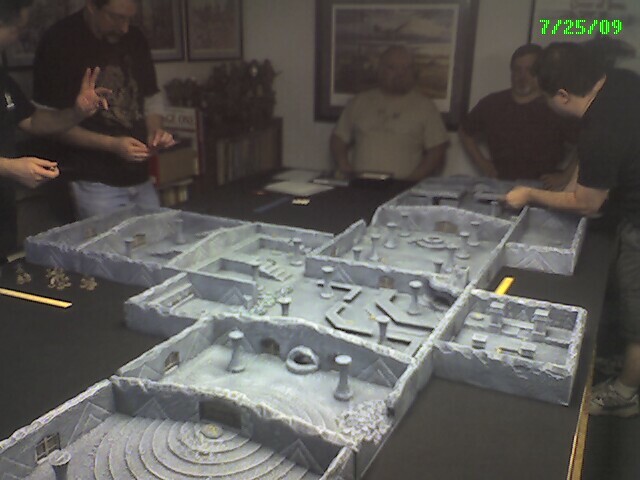 When two opposing legions meet on this board the battle is fought out on a different board representing the type of terrain the legions were in on the main board. Each player is represented by a special character (a Titan). When that character is killed the player is eliminated. Play continues until only one or zero players are left. If we run out of time, points will be counted (including mustered legions) and a winner declared. Beginners are encouraged, but I suggest reading the rules prior to the game. We're combining the new Axis & Allies Europe 1940 with Axis & Allies Pacific 1940 to create the greatest Axis & Allies experience to date, with a combined board measuring 5' wide by 32" high and over a thousand sculptured combat units. The games use the updated rules established in A&A Anniversary Edition and add two more units (tactical bombers and mechanized infantry), two more allies (France and Australia/New Zealand) and new rules for neutral nations, naval & air bases, kamikaze attacks and convoy disruption. PLEASE NOTE this event will run all day Sunday, in both the F & G game slots. Some knowledge of this rules system preferred. In A Game of Thrones the board game, players take control of one of the great Houses of Westeros. Via resource management, diplomacy, and cunning, they seek to win dominance over the land. Players must give orders to armies, control important characters, gather resources for the coming winter, and survive the onslaught of their enemies. A unique phase mechanic, battle resolution, and special ordering system make for an engaging game in which all players are actively involved at all times. If there is enough turn out we will have 2 games, One beginners and one experienced with Expansions. Beginners encouraged. Dave Cheng has taken a little time off from his duties as Dictator of Council of Five Nations to visit 1920's China. Warlord Cheng's army of regulars and his bodyguard of White Russians are on the road to Hanghai spoiling for a fight... but it won't be easy! The Mysterious Dr.Satan has infected the population so the dead reanimate as zombies. Even the usual cast of hero characters are not immune. Beware of Zombie Revenge on the road to Hanghai! All ages welcome at this game. A perennial Council favorite! Beginners strongly encouraged. Colonel Keene and the rest of the 35th Maine have finally decided to build a Fort as a base of operations. The Greenskins have not been seen for several weeks. The scouts and pickets have reported seeing them. Are they gearing up for an attack? Can the boys hold the Fort or will this be another Alamo? While not every Knight of the Republic is necessarily a champion of the battlefield, our distinguished Paladins, which are drawn from their ranks, will always be christened by fire. Due to the long standing peace in the Republic, one of the few opportunities for such displays of martial skill was during the yearly Knights Round Table Tournament, where Republic Knights could display their skills with the few Battlemechs that remained in regular use. With the damage to the HPG net, as a showing of solitude and support in these trying times, the Exarch has magnanimously agreed to broadcast the competition, so as to foster greater confidence in the continuation of Stone 's Dream. So come out for what promises to be a grand competition, and earn the rank of Grand Knight of the Tournament. The Joust will be held in a series of one on one battles, single or double elimination, depending on the number of registered players. Please bring four Battlemech Record Sheets, one for each weight class. Piloting and Gunnery Skills will be decided by the Tournament Director. PLEASE NOTE THIS IS A TWO-SLOT EVENT. It will run into the Sunday 3pm (G) time slot. Beginners encouraged. September 11, 1777. The more commonly played left hook by the British. Can you change history PLEASE NOTE: This game will probably go into the G (3pm) time slot. It 's been three years since the aliens first invaded Earth. Now the time has come to turn the tables on and put them on the defensive for a change. This mission will involve several units of troopers in an assault on an alien facility in an attempt to rescue human prisoners, gather Intel, and destroy their command center. Six captains sail a classic ocean liner from Southampton to New York City in the early 1900s. First to the docks will be heralded as a hero with parades and celebrations. Sounds easy, except that it will be in the springtime when ice bergs are breaking off of Greenland and drifting down into the shipping lanes! Six players will control ice bergs trying to sink the ocean liners making things interesting. Players under 14 should be accompanied by an adult. Beginners encouraged. This is a full, two-session Battleground tournament. We 'll use the Kingdoms cards to generate scenarios and terrain. You 'll have 15 minutes to construct a 2000 point army once you 've seen what you 're facing. Prizes awarded by Your Move Games. Prizes ~might~ include the brand new Dark Elves cards, hot off the presses. PLEASE NOTE: This tournament will run into the Sunday 3pm (G) game session. Beginners encouraged. Dennis Holland is not a good guy. He's responsible for bank failures, collapsed mortgages, and dozens of innocent people being forced from their homes. He collects seventies memorabilia. He's a bad man. And he's hosting a party. Nathan Ford and his Crew are on the job, but it has to be done fast, and there's not much time. Presented as a training exercise for newcomers and experienced gamers alike, The Quickstart Job lets you and your friends play Nate, Elliot, Parker, Hardison, and Sophie as they take down Holland and his corrupt schemes. Try out this brand new game based on the TNT series. Beginners encouraged. An ordinary voyage takes a grim and unexpected turn, leaving a small group of Witch Hunters to face a mysterious, unseen enemy with only their wits, faith, and courage. Lives hang in the balance ∧ perhaps more than mere lives. Dark Providence 2-0, written by Brian Schoner. Beginners encouraged. This product is a Pathfinder Society Scenario designed for 1st to 5th level characters (Tiers: 1 2 and 4-5). This scenario is designed for play in Pathfinder Society Organized Play, but can easily be adapted for use with any world. This scenario is compliant with the Open Game License (OGL) and is suitable for use with the Pathfinder Roleplaying Game. Pathfinder Society Scenario #33, written by Craig Shackleton. Please see the RPGA scenario descriptions at the end of the event listings for full info. Please also use the Warhorn.net registration to reserve a spot in a specific game, but use the event code above (G-RPGA) to purchase a ticket for any RPGA game in this time slot. Beginners are encouraged and veteran players are always welcome to DM. Beginners encouraged. Werewolves of Miller's Hollow is a game that takes place in a small village which is haunted by werewolves. Each player is secretly assigned a role - Werewolf, Ordinary Townsfolk, or special character. There is also a Moderator player who controls the flow of the game. In the timeslot allowed we will play 4-6 times. Alot of fun for kids and adults alike. Beginners encouraged. The Kingdom is in chaos. The King lies dead without an heir, slain by a villainous hand. Will a leader rise up and rally the support of the people, or will the shadow of anarchy spread over the land? Clever mechanics, colorful map and playing pieces including miniature mounted knights, cards, etc. Capture cities, amass enough wealth and influence and you can win a kingdom! Betrayal at House on the Hill is a fun, tile-laying exploring game where a team of players explore the old haunted house, trying to find the source of the evil... And who may have betrayed who. No two games the same, a different ending every time! Normal playing time is ~1 hour, so several games will be run in the slot. Beginners encouraged. Guide your village to success in Pre-revolution Cuba! Players start with an empty plantation and a group of villagers. Use your villagers to gather raw materials, and use those materials to build improvements to your land, or manufacture products like cigars and rum. Buy and sell in the marketplace for money, and ship goods overseas for points. Don't forget to vote in Parliament, where the right voter (or the right price) can direct the laws of the land in your favor. The player who gets the most points from shipping, using buildings, and following the law wins! Beginners encouraged. As a young adventurer, you strike out on your own to restore the honor of your family. You travel through many nearby lands performing good deeds. These good deeds include finding lost artifacts and delivering them to their rightful owner, safely escorting unusual beings to their destinations, and fighting dark enemies. Your journeys lead you on a quest to complete a heroic deed which will finally restore your family's honor. However, you soon discover that a powerful and sinister force, The Nameless, has risen up to plague and oppress the land. Gather your courage and strength, storm the tower of the Nameless, defeat him, and Return a Hero! Beginners encouraged. It's 1775 and the Sultan Muiz ud-Dinhas ordered his Moro pirates on a slaving raid as retaliation against the Spanish colonizers at Fort Pilar Zamboanga, located on the Zamboanga penninsula Mindanao in the Southern Philippines. This is a lighthearted Pirate raid. Kids and adults are welcome. Beginners strongly encouraged. ...Tactics - Flat & Furious!